August | 2010 | E-verything! Webinar Overview – Your PLN, what’s in it for ALL of us? This recent recorded session was a “Fine Focus” follow up to the preceding Serendipity session where we had looked at two topics. The second of these – a fleeting glimpse of PLNs was a bit “short-changed” in terms of time, so it seemed like a good idea to have a session on the significance of PLNs and some of the tools we each use. It must be emphasised that this was not a session on developing a PLN but very much a sharing of how our own PLN works for us and an opportunity to take away different ideas and tools. As always with Fine focus sessions that I facilitate I gave the session a clear structure to differentiate it from Serendipity which are deliberately unstructured unconference sessions. Firstly we spent a few minutes sharing our understanding of the term PLN, and then highlighting its most important aspect for each of us. Next we shared our own particular key tool – the one we felt played a pivotal role in our own PLN. Then we moved on to a look at how our PLNs look in our own minds. For this I tried out an experiment in using Elluminate slightly differently as I am always looking for alternative ways of doing things. Instead of using individual breakout rooms the group used their individual Elluminate work areas to draw a diagram/picture of how they perceived their PLN. We then transferred these to the whiteboard with limited success. As an alternative to breakout rooms (when there are bandwidth issues or time constraints) I think this has the potential to be a useful Elluminate strategy. I just need more practise and to be much clearer in how I explain the “how to”. We finished up with sharing the one tool or idea we felt we might take away from the session. This was (for me) a really interesting session as I always enjoy finding out about how people use their PLNs. I also very much value that these sessions give me the opportunity to maintain and extend my Elluminate skills as well as to learn about other tools and strategies . I also had a great “take away” from the session in Yammer. I have now explored this and begun a network for my workplace with several people already joining. 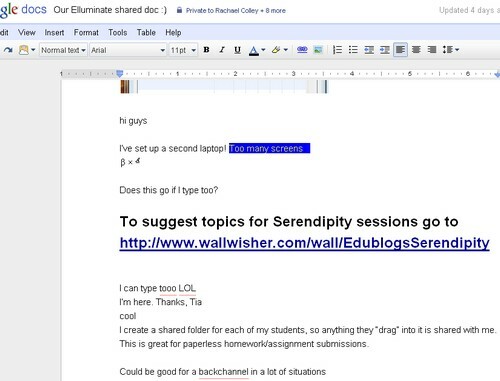 This was an exciting Edublogs “Serendipity” where we found out a little about some of the Web2.0 tools used by others. You can find the session recording here – my apologies I was slightly late starting the recording. We started as usual by putting some topic ideas on the whiteboard. Although this was done a little differently as we now have the Serendipity Wallwisher for topic ideas as well as those “on the day”. After some suggestions from those present I also shared the wall through application share for us to add topics from there. 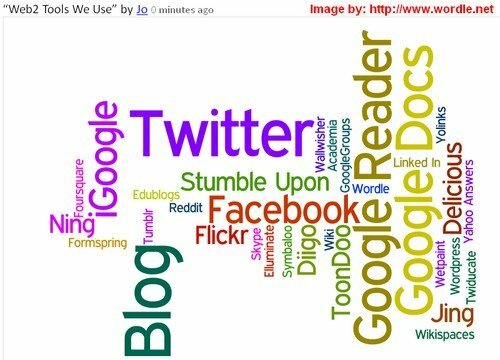 The poll on topics gave us a tie between Which Web 2.0 Tools Do You Use and “What is a PLN”. The group decided to look briefly at both as they seemed linked to some extent. We started by using the whiteboard to list the tools we use individually whether personally or professionally. We then highlighted those that appeared only once and invited the users of those tools to share the purpose of the tool and how they use it. In this way we were able to get an overview of several tools new to most of us. I certainly took away several that I will be exploring in much nore detail in the near future. Looking at tools in this way also led us into some discussion on our second topic about the nature of PLNs where we very briefly shared some thoughts about “What is a PLN”. We didn’t really have time to do this topic justice. This was a great session – the best thing about our Serendipity sessions is the spontanous sharing and learning that happens. Webinar Overview – Twitter Rules/GroundRules? 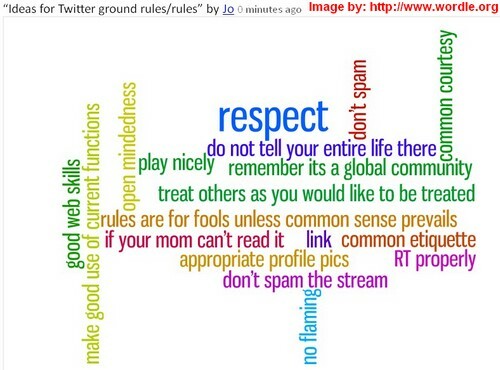 This was an Edublogs “Talk Time” around whether Twitter should, or should not, have rules and/or ground rules. You can find the session recording here. We started out by checking that we had a common understanding of the terms “rules” and “ground rules”. This was followed by quick poll to see how many people thought that Twitter should have one or the other or both. The main part of the session was occupied with why there should or should not be “rules” or “ground rules” for using Twitter and with ideas on the rules and ground rules that people thought were particularly important or essential. The session finished with some encapsulations of Twitter in nine words and a revisiting of the initial poll question on whether Twitter should have rules and/or ground rules. As always with discussions about Twitter this was a lively session. I find that “Talk Time” sessions are great for giving the opportunity for a more structured look at a topic than Serendipity. However I always have an underlying fear that I am being too “bossy” in structuring and keeping the session moving along. I suspect that this may be a result of consciously trying to ensure that these sessions are different from “Serendipity” and that they have a clear focus and direction in contrast to the unconference, go where you will, format of “Serendipity”. As usual our Edublogs Serendipity session was recorded and is a great example of Serendipity in action. As often seems to be the case we had an initial tie for the topic but a second poll resolved this into the topic of “Using Google Docs”. Luckily for us we had Rachael Colley @burntsugar with us. Rachael uses Google Docs all the time with her students and is very knowledgable about them. Rachael gave us a brilliant impromptu introduction to some of the features of Google Docs through a unique blend of Application Share on Elluminate and creating a Google document and sharing the link with us for us to “play”with a live document. Catch the recording to see how this worked. it was possible for Rachael to indicate/demonstrate features/tools on the App Share so that we could see where they were and how they worked. Rachael told us briefly about how she uses GoogleDocs with her students & how she and they experiment together. In the very short time available Rachael whetted our appetites for more and I hope she will soon be coming along to do a whole Fine Focus session for us on Google Docs. Watch this space! Our next Webinar is an Edublogs “Fine Focus” session a “Talk Time” session on “Twitter – rules or ground rules?” There are differing ideas on how Twitter is/should be used, what is “allowed” or “acceptable” or “unacceptable” behaviour. We would love your perspective on this for our discussion this week. This is the first of two or more posts I hope to write related to the recent (48 hours over the weekend from early morning Saturday July 31st to early morning Monday August 2nd in my timezone) Reform Symposium Conference, #rscon10 as it is hashtagged on Twitter. For simplicity I will use the #rscon10 tag rather than write out in full every time. that we really don’t need bricks and mortar anymore at least not in the sense of a physical place to meet for learning and networking. Firstly, all praise to the organisers Shelly (@ShellTerrell), Chris (@MrR0g3rs), Kelly (@ktenkely) and Jason (@jasontbedell) you did a fantastic job! Organising a global conference over 48 hours and across multiple timezones is a logistical nightmare and you did it brilliantly with only a few minor glitches. It was wonderful to have something like this (other than our own national events) that had sessions at Australia friendly times – my only regret being all those terrific sessions that couldn’t catch live due to the fact that unlike Shelly I do need to sleep! Speaking of which I believe that Shelly was in and actively moderating almost every session, and she was tweeting during the 5 hour breaks! This probably just confirms what most of us think already ie that Shelly is an alias for superwoman. As for the conference itself, the sheer intensity, immersive nature and sense of community and bonding generated by the experience has left me reeling, and I only attended a limited number of sessions! I’m also very familiar with virtual online conferences albeit not ones that run almost continuously for 48 hours. (The Australian Flexible Learning Framework has 2 day virtual conferences twice a year – just during daytime.) So I would guess that the impact has perhaps been even greater for those less familiar with this environment. 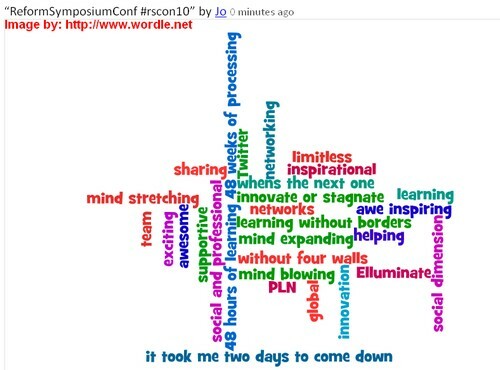 My overall feelings and thoughts about the Reform Symposium Conference of 2010 are expressed through the Wordle below. I love the thought that I have lots of great sessions still to watch. It will take me weeks to catch up with the sessions I missed ie those that were during the night for us here in Western Australia, but it’s a bit like having specially yummy treats that will be stretched out and savoured over time. This was a great weekend – the ripples are still (it seems to me) spreading. It has provided food for thought and reflection for a long time to come. I’m sure it will become (as it deserves to) an annual event, giving people more opportunities to network and learn. I’m excited and proud to have been part of this whole weekend. This was a very interactive session both on audio and in text, with Bill showing a series of video clips to illustrate the outcomes of his research and to stimulate questions and discussion. He set the scene with a short introductory clip about the project. Next came a look, from the student perspective, at student boredom in school and the activities undertaken to try and alleviate these feelings. This was followed by the scary side of the coin – secret recordings with hidden cameras! To finish Bill moved on to take a look at educators taking video in the classroom as a matter of course and using YouTube to publish these. This was a terrific session with Bill’s video clips providing a great focus for discussion throughout. As I almost always find myself saying the overview is just that! It provides a “taste”, for the full flavour check out the recording. Bill’s excellent preparation and pre-loading of the videos into the Elluminate Multimedia library meant that the whole session flowed really smoothly. I have been in sessions as a participant in the past where video has been used without great success and so was a bit apprehensive. This was a first for me in the use of video clips in a ssession where I was in a Moderator role and was (in my opinion) a great success. I feel that this was largely due to two things: a) the fact that Bill and I got together in an Elluminate room in advance and learned together what would work and what would not; b) Bill’s expertise and experience in working with video which enabled him to very quickly determine the best alternative for achieving his objectives for the session. Just to finish up, my apologies for the delay in posting about this webinar. I was swept up into the fantastic 48 hour Reform Symposium Conference (#rscon10) of which more in a later post. Our next Webinar is an Edublogs Serendipity – unconference session so bring along your hot topics and burning issues (what makes you spit with anger or thump a tub with passion) and throw them into the melting pot for the poll to choose our topic in the first ten minutes.